Jay Simpson’s second half equaliser keeps Orient in pole position at the top of League 2. Orient had fallen behind 7 minutes into the second half when half time substitute Jacob Blyth tapped in at the back post for Cambridge. Orient had created chances in the first half but found U’s keeper Chris Dunn in fine form. The East London side did level when Jay Simpson netted his fifth of the season did give Orient a point and keep their place at the top. Cambridge who were looking to bounce back from their 3-1 home defeat to Luton last weekend made 5 changes with Elliott Omosuzi, Jordan Slew, Josh Coulson, Connor Nelson and Danny Carr all coming in for the U’s. 3 changes were enforced with Harison Dunk suspended after his red card last week while Ryan Donaldson and Barry Corr were injured. Ian Hendon made 3 changes to his side that lost their 100% record away at Exeter last week with Fraser Shaw recalled to the starting line up in place of Alan Dunne while Jack Payne made his debut in midfield with Dean Cox missing out. Alex Ciask replaced Charlie Grainger in goal with the Australian back from International duty with his country. In a scrappy and dull start neither side were able to gain the initiative in the contest with possession given away rather cheaply. Without Cox in the midfield, Hendon opted for a flat midfield 4 with Bradley Pritchard and Sammy Moore asked to create width for the away side. Cambridge were struggling to create going forward but were trying to use the height of Robbie Simpson in attack with much of their play angled down their right hand side. The O’s who conceded from a corner last week at Exeter nearly saw the same happen again on 19 minutes. After a concession of corners Josh Coulson glanced just wide from a Luke Berry corner as he beat Alex Ciask to the ball. The O’s were finding it hard to make in roads through Cambridge, searching much of their attacking play in the channels with Jay Simpson looking lively. U’s captain Mark Roberts picked up a caution after a late challenge on Bradley Pricthard. Jack Payne who was making his debut for Orient after his deadline day switch from Peterborough was alongside Lloyd James, with both keen to dictate play. Both looked comfortable on the ball but lacked the incisiveness in attacking areas with many forward balls over-hit or wayward. Simpson could have netted the opener on 26 minutes, after a Mathieu Baudry through ball found Simpson, the front man struggled to make space for a shot as Josh Coulson retreated. Simpson touched it around Chris Dunn but his shot from an acute angle could only cannon of the post. The O’s were beginning to gain the ascendancy pushing men forward and trying to grab the opening goal. Connor Essam was a whisker away of his first goal for the O’s on 29 minutes after he met a James corner. The former Dover man’s header was tipped brilliantly over by Chris Dunn. With the visitors pushing forward, the game opened up more with Cambridge growing more into the contest. Micky Demetriou fired over before Danny Carr saw a header glance just wide of the post. 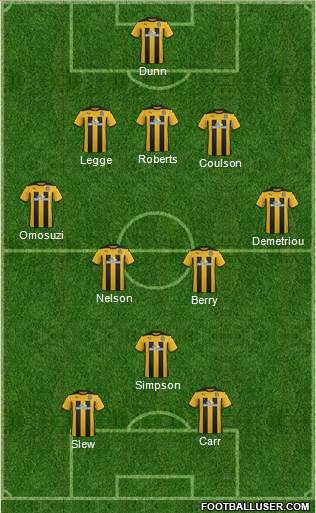 The U’s formation allowed Omosuzi and Demetriou to offer width in attack while Orient lacked width throughout the first half with Fraser Shaw looking isolated on the left side. Sean Clohessy was trying to offer an outlet down the right but much of Orient’s play was in central areas which Cambridge found easy to defend. Orient had trouble breaking down Exeter last weekend and were finding Cambridge a stubborn test. As the first half entered the last 10 minutes Orient looked to open the scoring. First Bradley Pritchard fired wide before Paul McCallum twice went close to grabbing his fourth goal of the campaign. The former West Ham man saw his header from another James corner saved down to his left by Dunn before heading inches wide from the following corner. Despite having the greater chances at the break, Orient still looked limited going forward with a spark lacking once more for the league leaders. Cox’s absence could be seen a mile off with Ian Hendon’s men lacking a tempo to their play with build up play very slow at times. Hendon earlier in the season had changed systems if it was not working but it was the U’s who made 2 changes at the break and not Orient. Jacob Blyth replaced Jordan Slew whilst Liam Hughes came on for Danny Carr. The second half started much like the first with neither side able to gain a foothold in the contest. But just 7 minutes after the interval the U’s grabbed the opener, Demetriou who was free on the left side for about a minute was found by Hughes. The left wing back beat Sean Clohessy to the ball crossing to the unmarked Blyth to touch home at the far post. A sloppy goal for the O’s to concede which saw them concede first for the 3rd game in a row and concede in every away match so far this season. Despite falling behind, Hendon did not make a change and nearly paid for that when Demetriou was once again free again on the left to cross. However this time former O’s forward Robbie Simpson could only put the ball in the side netting. Cambridge appeared happy to consolidate on their one goal margin sitting men behind the ball and keeping their shape. Hendon then brought on Blair Turgott for Lloyd James as Orient pushed for the equaliser. Turgott’s introduction appeared to kick the O’s into action with the tempo and speed of passing upped. But despite having the majority of the ball, the away side were struggling to force Dunn in to action with the U’s defending resolutely. Simpson who had drifted out of the game in the second half popped up to strike the O’s level. The former Arsenal man had looked to create space in the channels, collected Mathieu Baudry’s through ball and struck home underneath Dunn to bring Orient level. After equalising it was only Ian Hendon’s men who were searching for the winner however were still finding it difficult to create. Sammy Moore went close in added time but his effort from distance was tipped over by Dunn. A point a piece at the Abbey for both sides but only 1 point from the last 6 available, should their be cause to worry? Well Ian Hendon stated that after last week’s defeat he got the response he was looking forward. Dean Cox missed out after not training in the latter part of the week and Orient did miss the influential play maker in attack. Based on chances, Orient feel they should have won the game with Dunn by far the busier of the keepers on the day. On another day Orient would have scored 2 or 3 but found Dunn in inspired form between the sticks. After the heavy defeat last weekend, Orient did look more confident in defensive areas but Cambridge rarely troubled the League Leaders. One concern for Hendon will be his sides inability to break down a well drilled side, his side failed to create in the final third at Exeter and it was somewhat the same story at Cambridge. Barring set pieces, the O’s created little from open play which may concern Hendon after his side scored for fun in the opening 5 games of the season. It is clear to see that Cox was missed but the O’s lacked width and tempo in their play for the majority of the game which was why it was surprising that Hendon did not bring Turgott on until his side fell behind. McCallum was once again quiet in attack but had very little to feed on but Pricthard, Essam looked solid once more. Payne was quiet on debut but is far from a full match fitness. Orient have clearly seen in the past 2 weeks what teams will do when preparing to face them, sitting back and making Orient break them down. It is something that Hendon will definitely work on but the main concern today was the lack of spark and tempo. A home match with Wycombe awaits next weekend and with the Chairboys in fourth position it is set to be a key contest. 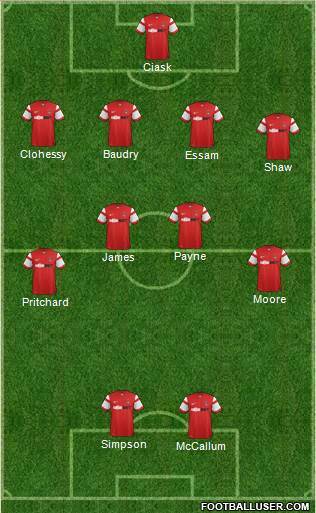 All Orient fans will know that we should be able to gauge the season after the Wycombe result next week, with all 11 players performing Orient will definitely pose a real threat to Wycombe who suffered defeat at home to Plymouth today. There appears more evidence on today’s showing that Orient are a work in progress side.